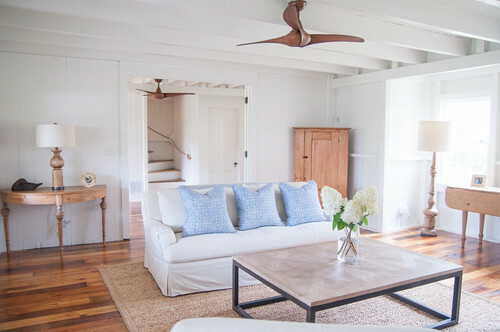 You probably think ceiling fans are just seasonal products but they can actually be used all year round. In the summer time you can use a ceiling fan to stay cool. Paddle fans do not change the actual temperature and operate similarly to wind chill in the winter. It changes the perceived temperature on your skin by fanning the heat away from your body. 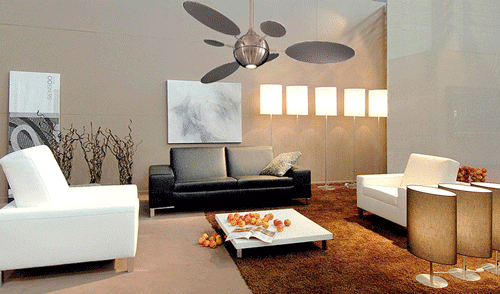 There are many different style ceiling fans available on the market today. Standard fans are usually between 44” and 52” blade span. When picking out a ceiling fan you should really consider CFM or cubic foot per minute. CFM is the measurement of how many cubes of air the fan actually moves. Fan pitch or blade angle is also important. The angle determines resistance to air. Greater angles of 14 to 16 degrees mean more resistance and circulation. Quite simple, Minka-Air is now the design leader in paddle fans. They have the most interesting, yet affordable fans on the market. All Minka-Aire fans listed have remote controls and lifetime warranties. Stylish outside fans are in short supply. The Gauguin is great outside with its island “Tommy Bahama” like chic. With its post modern look, gear like motor and 62 inch size, the Gilera is great for loft and other large spaces. The Kewl is a fun fan for a kitchen or contemporary space. It is the best looking $99.95 fan on the market. The Aviation fan is fashioned after an antique airplane prop. It’s modern contempo style is sure to compliment any space. The wing is a design statement without question. At 5974 CFM, it moves a ton of air. The Wave fan draws inspiration from the ocean waves and it’s tubular forms making it perfect for a beach inspired space. The Geo-Gem fan is a truly innovative fan with LED bulbs and intriguing crystal prism design. It is sure to add beauty and coolness to your space. The Dyno is an upgrade from a standard fan with LED lighting and newly designed motor. My favorite fan has to be the Slipstream with 8 blades and 65 inches, this fan is designed to tackle and deliver air in larger spaces.